We have two fresh faces in the Apogee office, and we’re thrilled to introduce them to the wider Apogee world. While both Massachusetts natives, Isa Caliandro and Marie Abrahams join the crew as Assistant Directors coming, most recently, from much further away: Isa from (way) upstate New York and Marie from Boulder, CO. 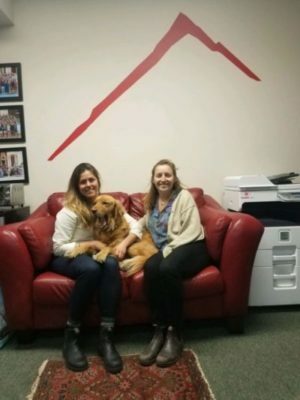 Despite taking quite different paths to their new roles at Apogee, they’ve already begun making positive impacts in the Apo-sphere, and they both bring fantastic energy, new perspectives, and strong work ethics to our office community. Check out Isa & Marie’s (very impressive) bios below, and please join us in welcoming them both to Maine and the full time Apogee family! Assistant Director Isa Caliandro of Concord, Massachusetts started her Apogee career earlier than most: in 2009, Isa was a participant on our erstwhile Vermont Hiker trip, and she explored Washington State in 2010 on our Northwest Explorer trip. With a love for the outdoors and for travel that was sparked early on, Isa spent a semester of high school at the High Mountain Institute in Colorado, followed by a gap year before starting college, during which she climbed in Chamonix, hiked the Tour du Mont Blanc, and worked on organic farms in Wales and England. She concluded her year by hiking the first half of the Appalachian Trail. A 2018 graduate of St. Lawrence University (SLU), Isa studied Environmental Studies and acted as Vice President of the Outing Club on campus. Also at SLU, Isa spent a semester deep in the backcountry of the Colorado Plateau as part of a field studies program, where she backpacked and studied the environmental, geological, and anthropological history of the region. After graduation and leading her fourth Apogee trip, Isa packed up her Subaru wagon and spent the next several months out west, leading backpacking trips in Joshua Tree and Yosemite for a California private school, learning to backcountry ski in Colorado, and generally enjoying life, per Isa’s usual demeanor, before driving back east to her new home in Portland, Maine. In her free time, Isa loves to eat snacks, do printmaking, and watercolor paint! Finally, we can’t forget Isa’s four stellar summers as an Apogee trip leader, where she led Scottish Highlands, New England Mountains & Coast, Maine Coast Junior, California Mountains & Coast, and Alps Explorer trips. She’s excited to now add “Assistant Director” to her already extensive Apogee resume! Assistant Director Marie Abrahams was born and raised in Massachusetts, and quickly developed a passion for adventure and travel. Even before starting her career at Colby College in Maine, she traveled to India on a service trip and worked at an orphanage in Ecuador. At Colby, she studied Environmental Policy while spending much of her free time skiing and singing in the chamber choir. Along the way, Marie spend her first semester in France, traveled to Costa Rica to live and work on a farm, and joined a professor on a research trip to Ethiopia, where they studied the fascinating phenomenon of church forests. During her summers at Colby, Marie continued to pursue her passion for outdoor education and worked at a summer bike camp called Strong Wings, located on Nantucket. Following her graduation in 2014, Marie and her partner spent three months backpacking throughout Southeast Asia, adventuring (and eating) their way through Cambodia, Thailand, Laos, Vietnam, and Indonesia. 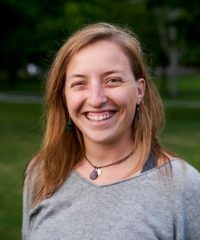 Returning to the States, Marie moved to Boulder, Colorado, where she furthered her career in the outdoor adventure industry while working with the adventure summer camp, Avid4 Adventure. There, she started as an Instructor, leading teenagers on all sorts of adventure activities: rock climbing, mountain biking, whitewater paddling, and whitewater stand-up paddleboarding. Marie then transitioned into an Assistant Director role, where she took part on the staff hiring team, before eventually serving as Director of one of Avid’s day camp locations, where she oversaw all of the day-to-day operations, including risk management, staffing, admissions, etc. When Marie isn’t hiking, skiing, or baking bread, you can probably find her singing along to one of her favorite musicals; Marie and her family are huge fans, and her Broadway resume includes an original cast Hamilton show and too many Wicked performances to count (if you’re jealous, you’re not alone). 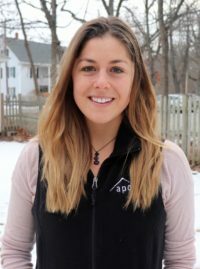 We’re thrilled to welcome Marie to Maine and bring her extensive outdoor education experience and background to the team!